I’ve had half a packet of orzo left in my cupboard for a good while now (since the last time I made my Pea and Ham Orzo) but I wanted to try and use it in a new way. 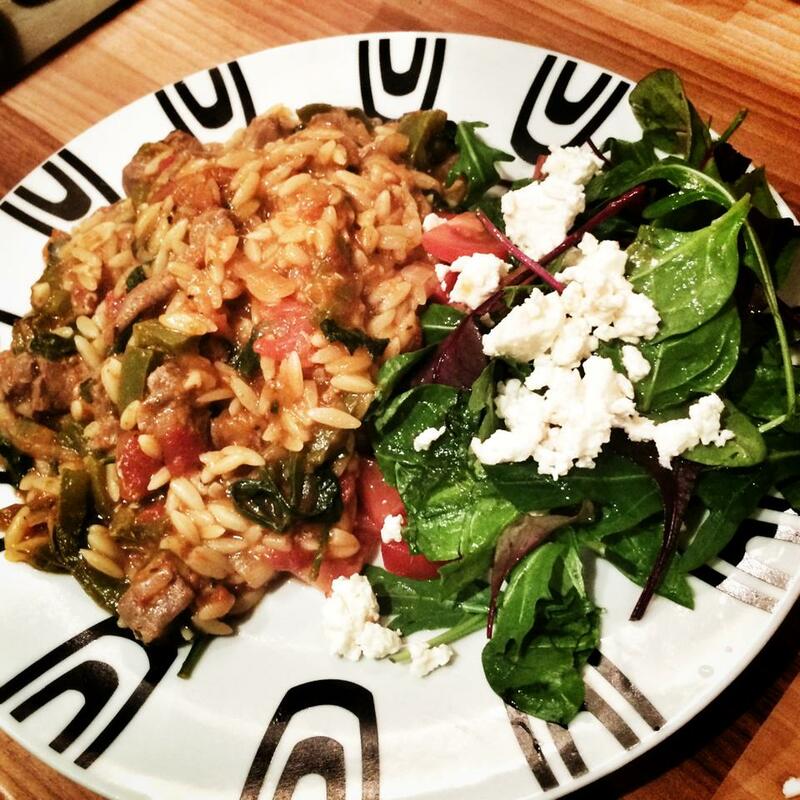 Having seen lamb paired with orzo on Greek menus quite a lot I thought it was time I gave this a go and made it waistline friendly. The result was lovely, a lovely flavour and a really different texture. I served mine with a side salad (just mixed leaves, tomatoes and feta) and I served my OH’s with the feta straight on top. Do whichever way takes your fancy. Some of the ingredients below can be optional so I’ve put a little ‘O’ next to these ingredients, the recipe is better with them but would still be nice without. Preheat the oven to 180 Celsius. Take a large oven proof pan and pop on the hob. Pop in the lamb, season well and fry in 1kal until browned on the outside. Then add the onions, peppers and garlic, fry until the onions soften a little and then add all the spices. Fry for another minute or two and then add the red wine. Simmer until the wine reduces a little and then stir in the tomato puree. Next add the stock cube with 600ml boiling water and the chopped tomatoes. Give a good stir, pop a lid on the pan and put in the oven for 1 hour. Give it a stir half way through the hour. After an hour add the orzo, stir in and pop back in the oven for another 20 minutes (again stirring halfway through). After 20 minutes, the dish should still be nice and wet but not too loose. Take out the oven and add the spinach (the heat will wilt the spinach nicely) and then add the juice of half a lemon. Give a good stir and then plate up. Top with the feta cheese (or if you are making a salad pop the feta on that) and enjoy!! I have just made and eaten this – OMG it was amazing – Thank you ! This is delicious! My 18 year old son is off to Zante tomorrow and I cooked this to get him in the mood. I will definitely be cooking it again – it was so easy to prepare and the taste was amazing!! This is the first recipe I have tried from this website and I have printed off a weeks worth that I am going to try out this week. Thank you.